What did Trans Pathways tell us? Strauss, P., Cook, A., Winter, S., Watson, V., Wright Toussaint, D., Lin, A. (2017). Trans Pathways: the mental health experiences and care pathways of trans young people. Summary of results. Telethon Kids Institute, Perth, Australia. Some of the topics discussed in this report may be distressing. Please reach out for support if you are feeling distressed. Non-urgent mental health support is also available through headspace (1800 650 890). Trans Pathways is the largest study ever in Australia of gender diverse young people and their mental health and care pathways. Researchers surveyed more than 850 young trans people (14-25 years old) and almost 200 parents of trans young people across Australia. Drew is 16 years old. He came out as trans two years ago. This is his experience. 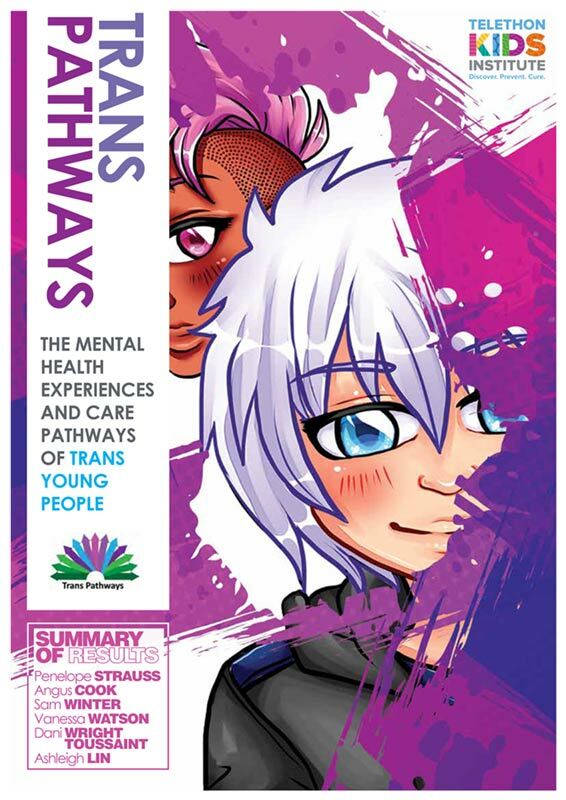 Trans Pathways is the largest study ever conducted of the mental health and care pathways of trans and gender diverse young people in Australia (859 participants).